We feel happy by seeing our baby sleeping comfortably; there is nothing more worthy in the world than a glowing and smiling face of a baby. 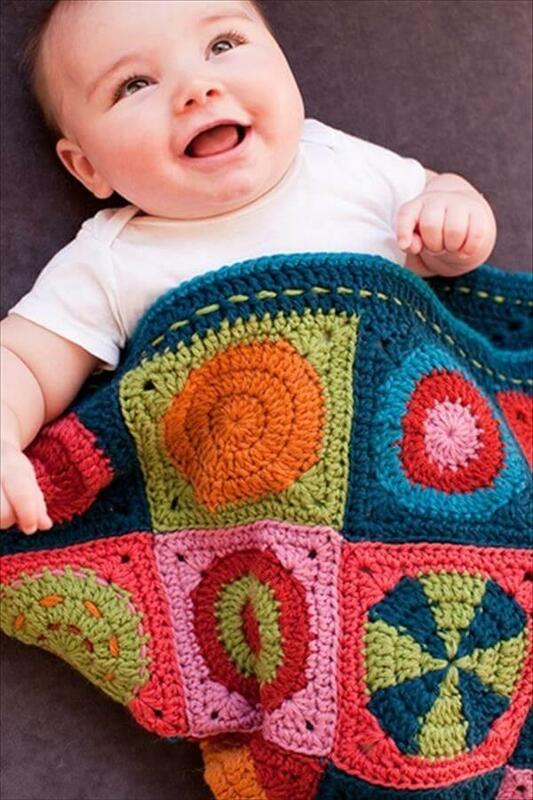 To give your baby a comfortable and secured type of feel in really chilly and deadly cold weather we have some inspiring free crochet baby blanket patterns which have been crocheted with highly soft type of bulky yarn. You can use custom bulks and colors of yarn strands to get your own favorite comfy layouts of winter warmer blankets. We have introduced a variety of simple, vintage, chic, cozy and modern baby blankets which are really new discoveries through great art of crocheting. 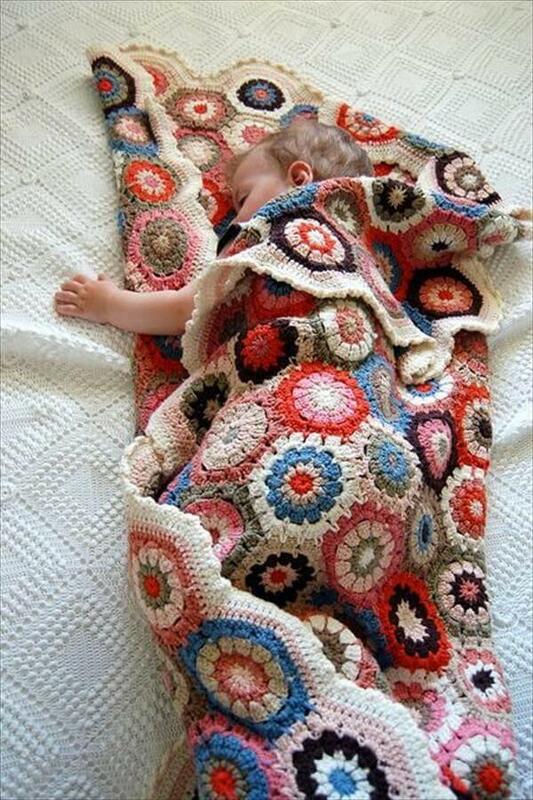 You can try these subtle DIY afghan crochet for comfy sleep child. 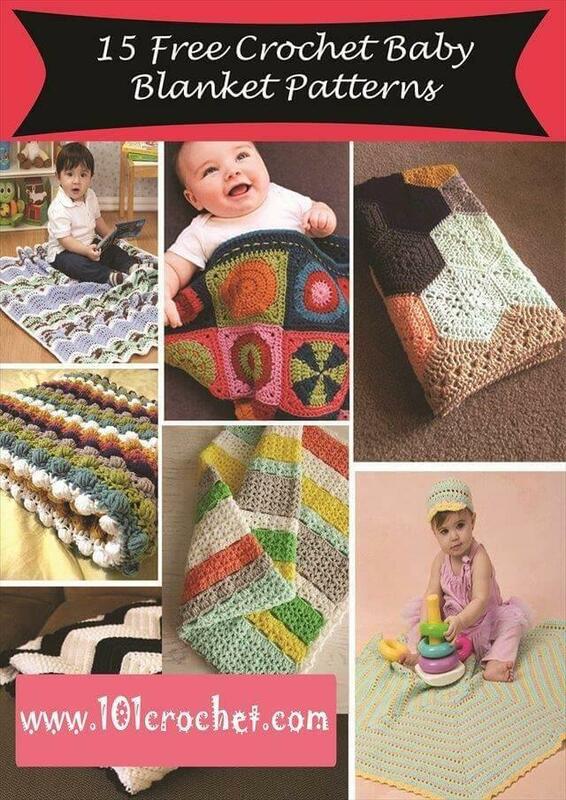 We have chosen these DIY free crochet blanket patterns with easy skill level so everyone can give a try to them. Various crochet stitches, like treble crochet stitch, chain crochet stitch, half double chain crochet stitch and lacy crochet stitches can be used to creative arresting and spellbinding styles of patterns. We have also share 10 free and cute crochet hat patterns for kids. These blankets will work great for newly born and 6 month babies and will also work appreciably for strollers and bassinets. 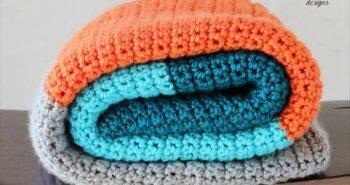 These blankets can also spice up your car seat along with some needed amount of warmth. Use the soft type of yarn strands for comfortable and safe touch to baby skins. Each unique piece can also be used as a worthy winter gift too. Brows below the crochet blanket ideas to explore the hidden crochet creativity and trends to get a complete guide. 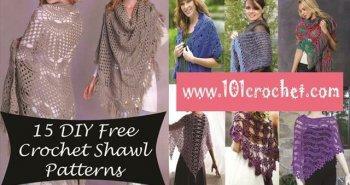 Enjoy these free crochet patterns which look not only fancy but also a very lasting in nature. Polka dot in blue has been made on chic white background theme of blanket for just pretty kid’s special impact. It would not be safe to make your children sit on cold floor in winters; try to crochet some blankets in artistic designs to make the floor warm for your kid’s playing. Try to raise your design in some geometrical shape to draw the eyes of your kids and this hexagonal pattern will also be a great funky choice for blanket pattern. If you are living in an area where the winter season comes with deadly cold blasts of air then such a bulky mass of baby blanket will provide a great warming protection to your 6 month old baby. Circular and hexagonal shapes go all the way long through blanket and really make the design artful and arresting. 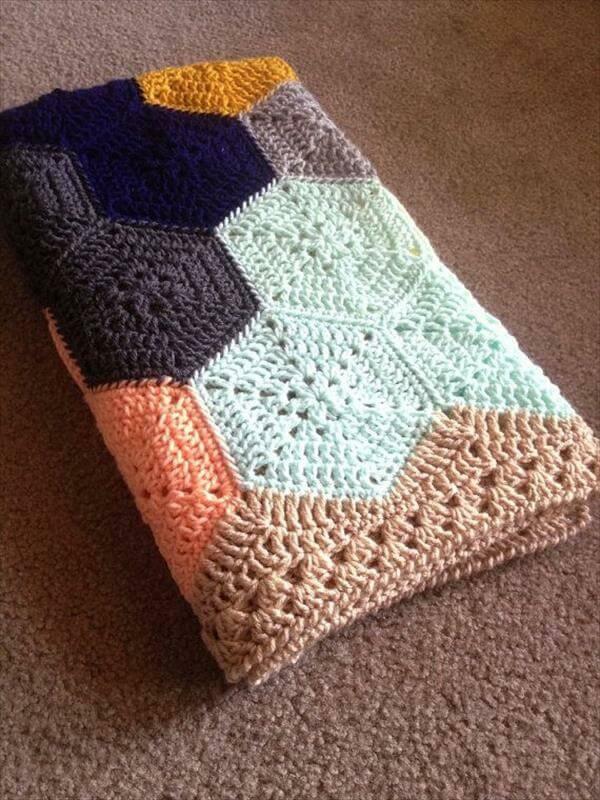 If you want to try a simple, budget friendly and gift-worth crochet project then choose this square pattern blanket to be crocheted with your own creative hands. It will work great for the bassinets and baby strollers to provide the exact amount of warmth. Diagonal rows of colorful square patterns really make it stunning and unique piece of crocheting art. 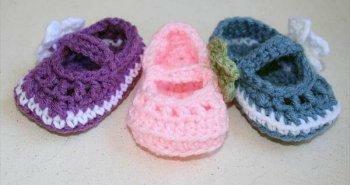 You can also produce some Memorial Days gifts through crocheting. 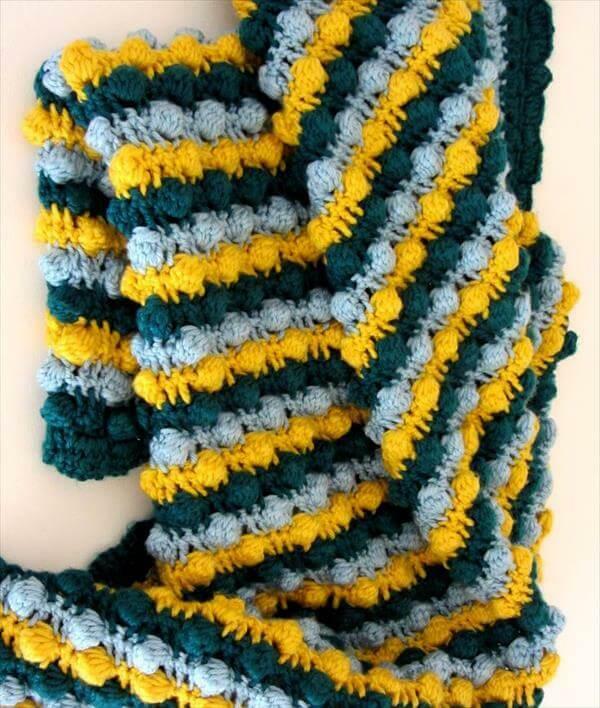 This chic crochet pattern of blanket will work as a great Mother’s day gift. The geometrical shapes are really looking electrifying and make big cozy statements of crocheting art. Blankets just play a very vital role as a baby warmer in winters. If you like the crocheting art then choose some really soft and baby’s skin-friendly strands of yarn to crochet this no-brainer crochet blanket to wrap around your babies. Different geometrical pattens just style it up to catch the eyes of viewers. 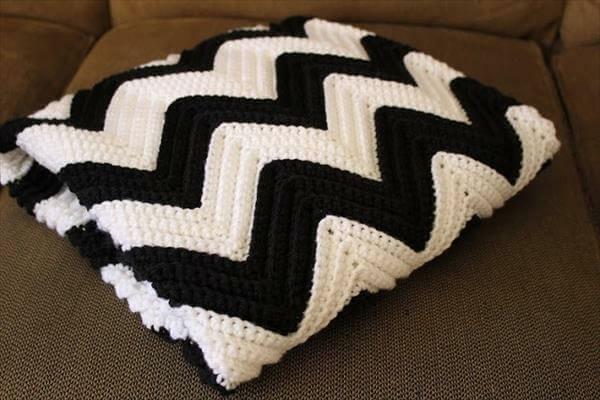 The possibilities of crochet blanket patterns are just never ending if you really want a crochet pattern from modern crochet fashion trends then this chevron style will be a really right and according selection. Black and white shades of yarn really spice it up to be visually attractive and pleasing. 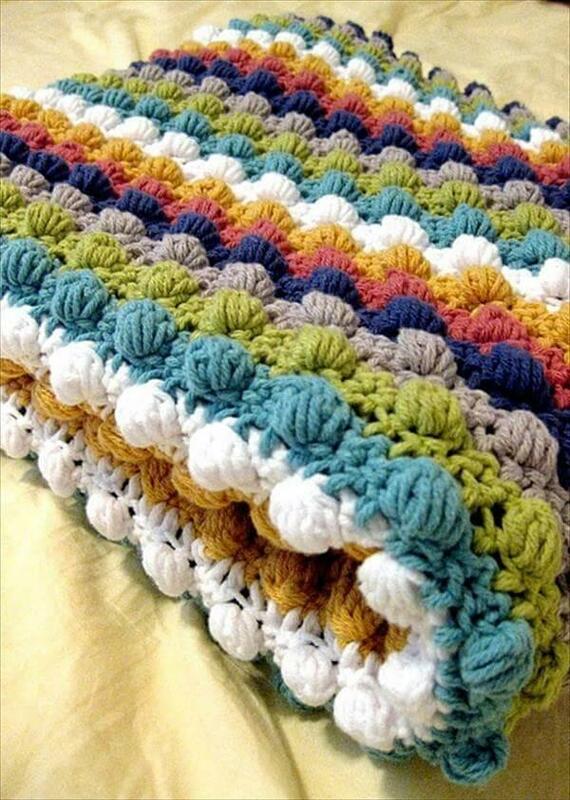 Don’t let your creative crocheting hands stopped without giving a try to this eyeful type of blanket crochet pattern. If you are not having a baby to be protected against deadly cold-weather with this blanket then it can serve your car seats as an alternative purpose and use. Test your crochet skills and discover some hidden secrets and helpful technique of crocheting by making practice with such an rare crochet patterns. If you really get a great success in producing this bobble baby blanket then it can serve you all the winters long as a perfect baby warmer. 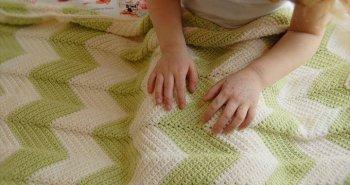 Baby blankets should be crocheting with soft thread and yarn to keep safe the baby tissue like skin. 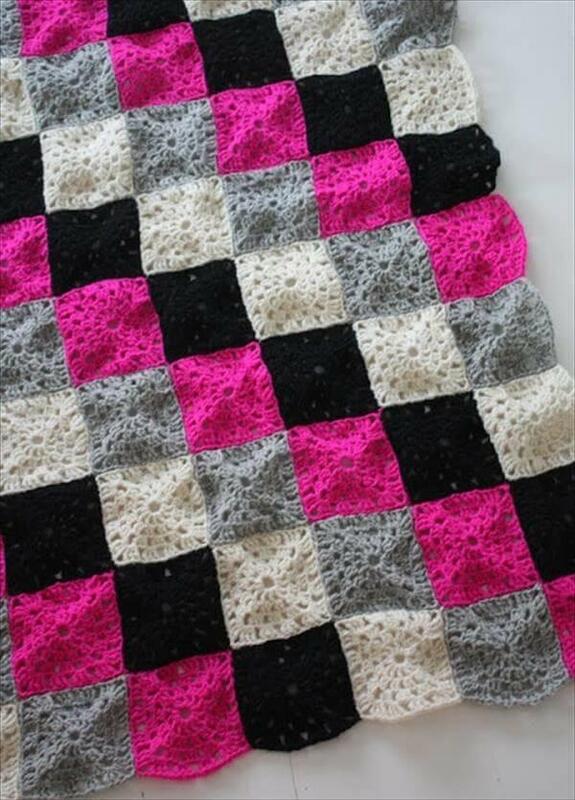 Just create a chic baby floor by getting this pink and rose colored baby blanket through your own skills of crocheting. Artistic squares and flower designs really create the fantasy of baby world. 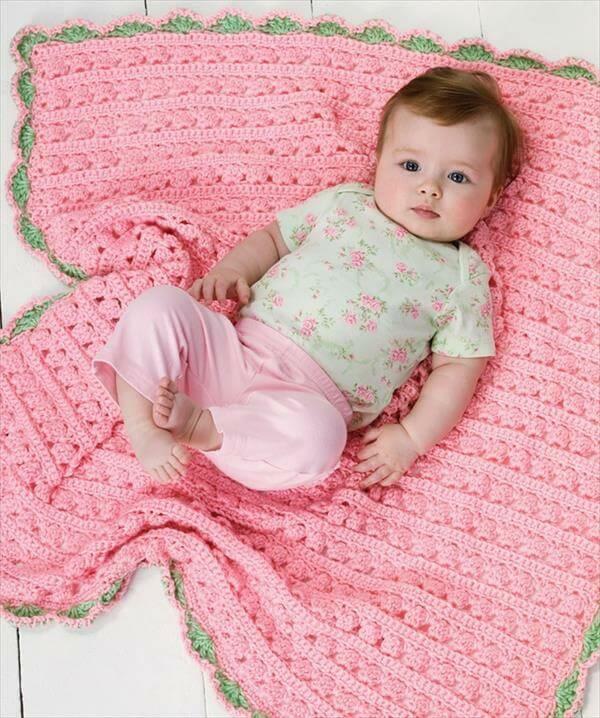 If you are creating a blanket pattern for your little cute baby princess then pink color will be a great choice. If you add some flower patterns it will really spice it up. You cute baby can mess with this blanket, cay lay on it down and it will also make your baby warm if your will find it necessary. 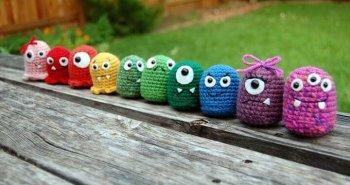 Choosing some vibrant colors of yarn really make the targeted crochet craft stunning and eye-catching. This artful type of crochet type really addresses the modern crochet trends and is just held much precious in caring a baby in dead of cold. Bobble stitching pattern really adds the impacting grace of it make a very soft and luxurious touch to your cute baby skin. 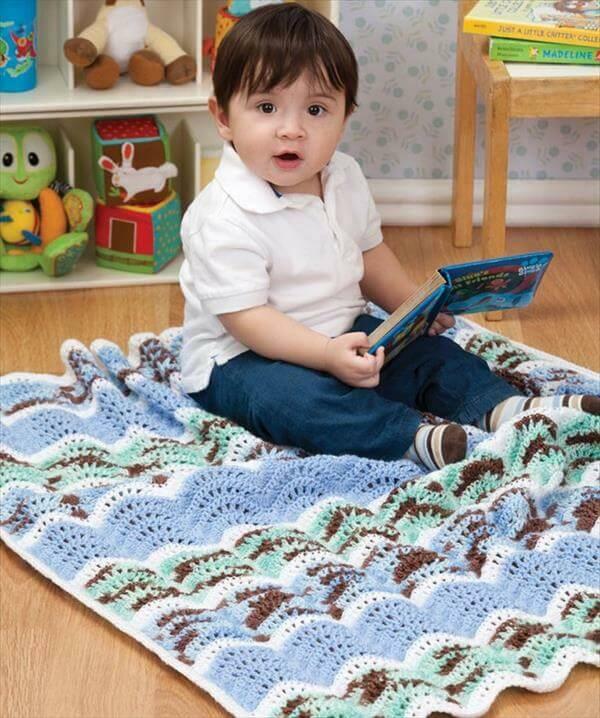 This amazing blanked pattern has been crocheted with cozy shell stitches which form some chic wave like pattern. 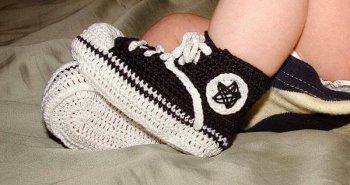 Make your baby well sit on this woolen warm blank to avoid the cold floor underneath. This pattern is much easy to crochet even if you are a dedicated beginner to crocheting. 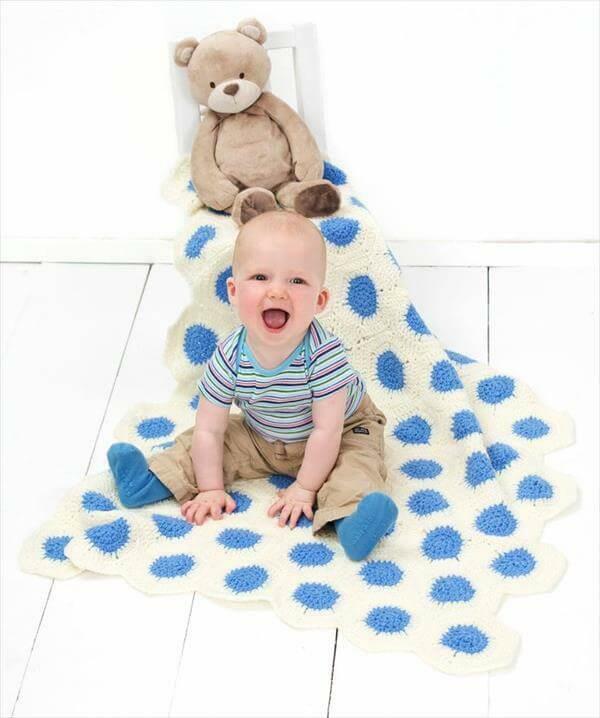 This blanket is the best winter refuge for your baby to snuggle down into to get warm and sleeping relief. 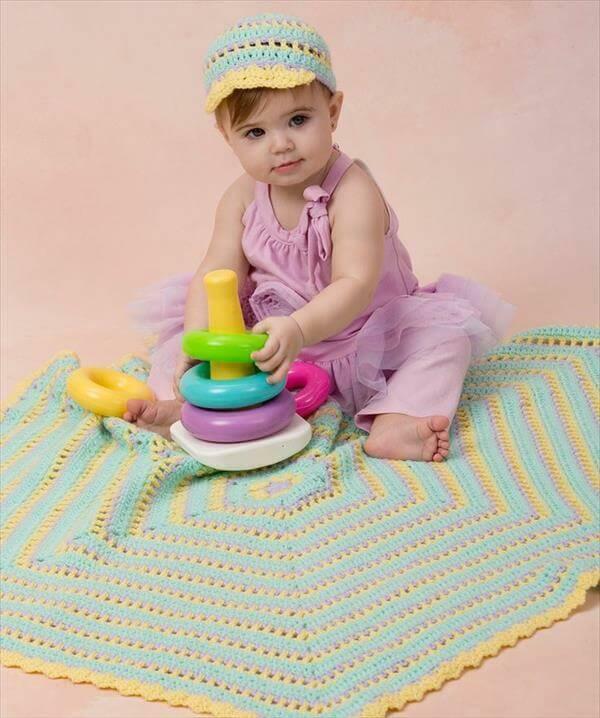 To get it according to your child’s fantasy make use of some visually pleasing colors of yarn strands just like has been used in this chic crochet blanket pattern. This pink mass of crochet blanked will surely cuddle your baby close to provide the warmth in dead of cold. The green flower edging makes great vintage expressions which held much eyeful and captivating as a perfect squared boundary. 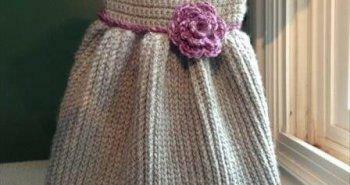 Use this worth crochet pattern as a gift, winter warmer and a chic carpet for your baby kid. 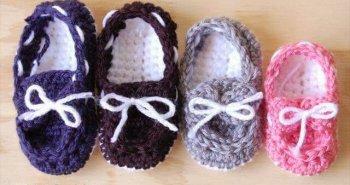 Just get your creative hands and crochet hook ready to craft these pattern for your winters. 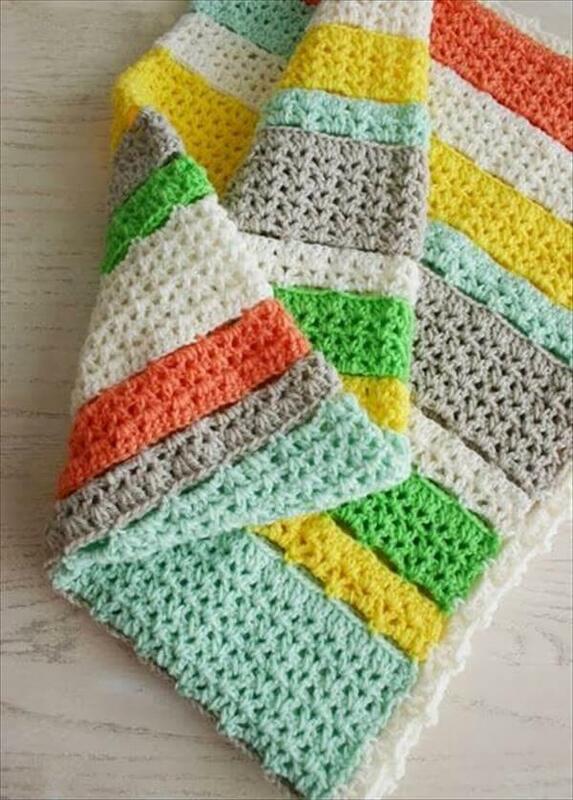 If you really know how to crochet then this will really a good trial of your skill to crochet these comfy DIY crochet afghans for your kids. All these hilarious pattern and popular fusions and combinations of modern crochet stitches really lead to out of ordinary and unique crochet trends. Add your favorite one inspirations of these crochet patterns to your to-do list of winter crochet crafts and also have a great fun with crochet scarf patterns.